New Zealanders need to work together to tackle the “complex problem of the biological greenhouse gases from agriculture,” warns the Parliamentary Commissioner for the Environment in a new report. The report Climate change and agriculture: Understanding the biological greenhouse gases, released today, aims to tease out various issues in the fraught area of biological emissions and signpost solutions. nitrous oxide created by soil bacteria breaking down the nitrogen in urine and dung from farm animals. Together they make up about half of New Zealand’s annual greenhouse gas emissions. 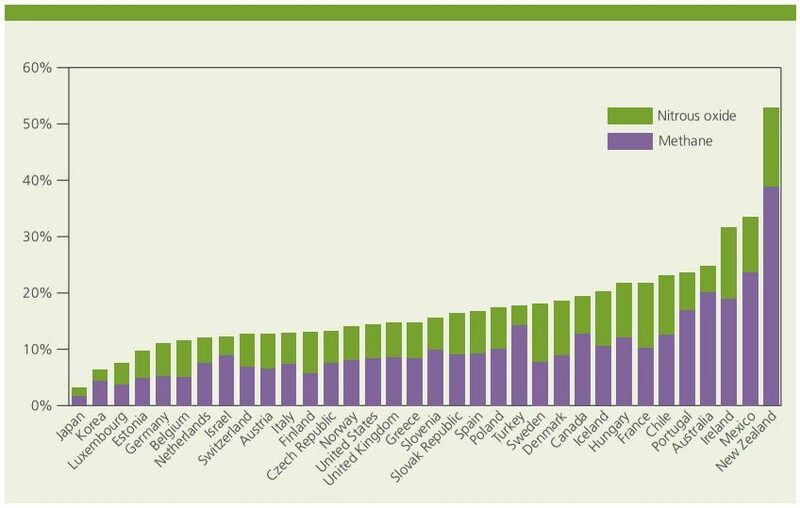 In terms of the proportion of methane and nitrous oxide in our emissions profile, we rank first among OECD countries. Methane and nitrous oxide as a percentage of the total greenhouse gas emissions of OECD countries in 2010. Both gases are expressed in carbon dioxide equivalents. 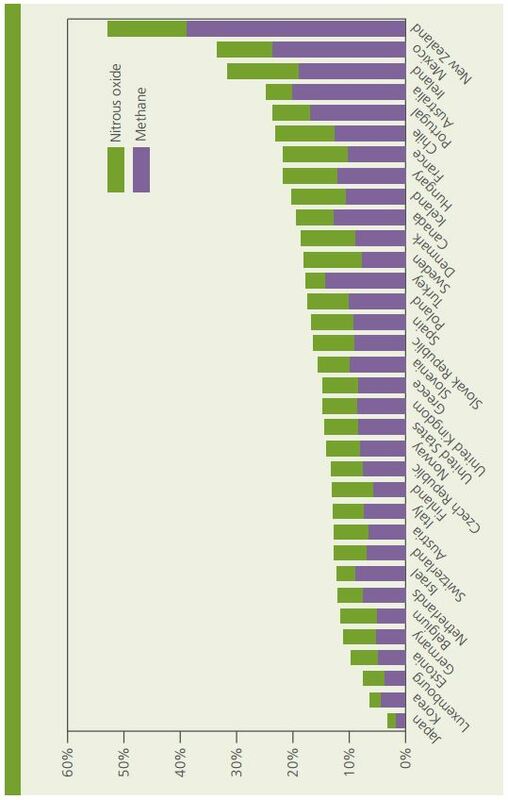 Methane and nitrous oxide from all sources in each country are included, not just from agriculture (From PCE report). Read more about the report on Scimex.org. The report explores a number of possible solutions to the agricultural greenhouse gas problem (see below) but in particular growing more trees is highlighted as an immediate action to offset agricultural emissions. “It might not be the whole solution, but a million hectares of trees would make a big difference – not to mention the added benefits for erosion and water quality,” says Dr Wright. The Government has also recently set up working groups such as the Biological Emissions Reference Group to look at issues arising from agricultural emissions, and Dr Wright says this is encouraging. But she warns that change is now inevitable. 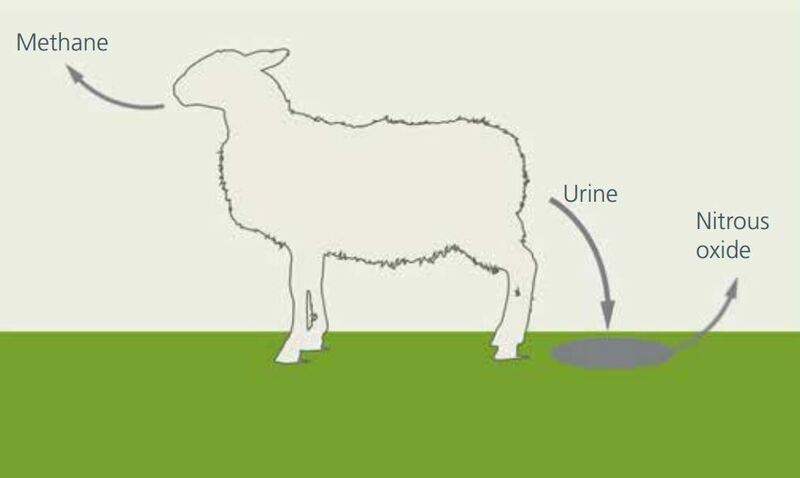 “Contrary to popular belief, almost all of the methane comes out of the front end, not the back end, of ruminant animals.” This diagram from the PCE report succinctly summarises the situation. “This report clearly lays out the case that New Zealand’s rather unique greenhouse gas emissions require bespoke solutions. The report argues that even if we reduced much of CO2 emissions from fossil fuels, we still would have relatively high emissions due to nitrous oxide and methane primarily derived from agriculture. To deliver solutions to this problem we need tailored research on New Zealand farms with New Zealand farmers. “The report by the Parliamentary Commissioner for the Environment provides a highly accessible summary of potential solutions. More importantly though, it concludes by considering the next steps: how we can collectively ensure that our science can be adopted to the benefit of the country and the climate? The research being done on selective breeding is important and holds promise. But it would take a long time before it would have a significant effect at the national level. Altering what livestock eat is another potential avenue to reduce emissions, but the report notes developments in this area, such as supplement feeds and genetically modified rye grass, are not very promising. Even a very optimistic scenario would not see inhibitors tailored for New Zealand becoming available before the 2020s. The development of a vaccine would take longer, if it can be done at all. When it comes nitrous oxide from dung and urine, potential solutions include inhibitors which target soil bacteria, or moving stock to stand-off pads or into barns for parts of the day allowing for the collection of excrement. Immediate opportunities for reducing New Zealand’s emissions lie in new native and plantation forests, says the report, which points to several success stories where tree planting already has benefited some farmers. So disappointed to see this government scientific report promoting ignorance and casting doubt on several avenues of promising research on reducing methane production in cattle ruminant stomachs. I challenge you. Just put it in your search engine and find the published studies on feed supplements including algae, seaweed, and mixed forage are all proven to reduce methane organically. All we need to do is find the right recipe of feed for NZ conditions and we can surely reduce the belched methane by half on prototype farms. When we find the answers to reducing methane production, the cattle will improve in production of meat and dairy as that methane represents lost food energy for the animal. The answers to these questions are already on the shelf in published studies. All that remains for our research universities to do is prove the results with duplicate experiments and then refine and improve on the concept. Where is the NZ government funding for this vital research? Here’s an idea: cancel all subsidies for oil/gas/coal and put all of that funding into this basic research and pilot programs. There are homegrown technologies that can address the problem right now but they wont get a look in as long as the CRIs are dependent on ongoing funding. Why would any of them admit there is a solution when their jobs depend on the funding gravy train ($20 million per year – ongoing as long as we still need to keep looking for the solution)? These researchers cant even acknowledge potential solutions for fear of future IP complications. Unfortunately these same researchers are providing the advice that the PCE has based this report on. New Zealand could be leading the world in addressing agricultural emissions (and making a hell of a lot of money from it) but reports like this are putting the brakes on any private development of technology – the PCE says there is no solution and anyone who says there is should be treated with extreme caution – how damaging is this type of statement to companies developing emissions technologies? I’d go as far as to say that the PCE has been irresponsible and failed in her fundamental duties by releasing this report.